Just a few weeks ago, we announced the launch of LinkedIn Learning, an online learning platform that empowers individuals and organizations to achieve their objectives and aspirations. 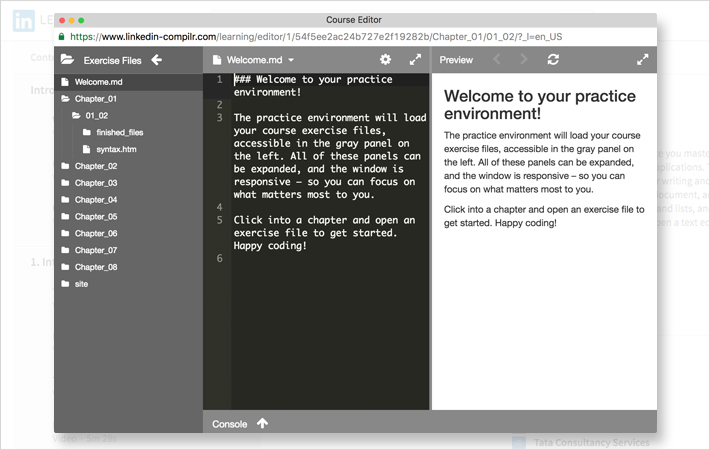 But after reading about it, you’re probably wondering – how exactly does LinkedIn Learning work, and what makes it so unique? Well, the answer lies in LinkedIn Learning’s combination of world-class content and data-driven curation, packaged in a convenient way that fits learning around your schedule. But rather than tell you how LinkedIn Learning works, we'd like to show you. We’ll start by showing LinkedIn Learning through the eyes of a learner and then take you through the experience for a manager or learning and development professional. 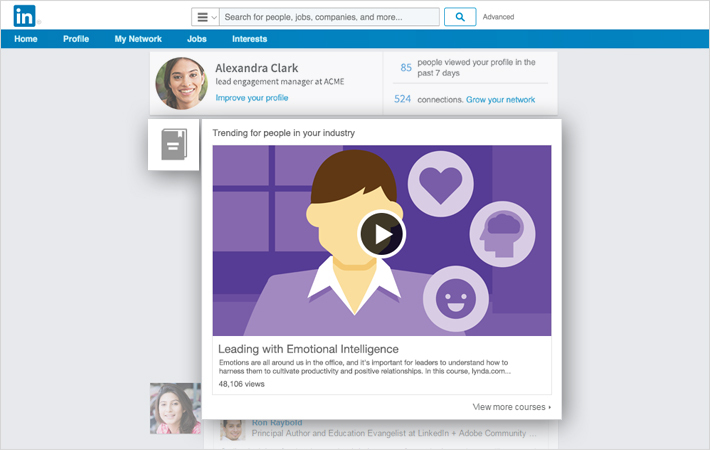 To show how LinkedIn Learning helps an individual discover and develop new skills, look no further than the fictitious Alexandra Clarke. Alex is a lead engagement manager for Acme Corporation charged with engaging customers through various marketing channels. One morning at work, Alex started her day by quickly scanning LinkedIn. As she browsed her feed, she saw something that interested her - a LinkedIn Learning course on leading with emotional intelligence. Intrigued, she clicked on the course and was brought into LinkedIn Learning. Alex watched the course preview and was immediately impressed by the quality of the content. But on that particular day she had a more pressing need. The web resource assigned to her was out on vacation, so she needed to learn basic HTML herself to launch a customer newsletter that had to go out that week. She searched LinkedIn Learning and quickly found HTML Essential Training. On the course page, Alex saw that the course was broken into 10-minute-and-under sections, allowing her to jump to the lessons that were most important, if pressed for time. She also learned that the course is taught by James Williamson, who has been teaching HTML and web tools for 16 years. 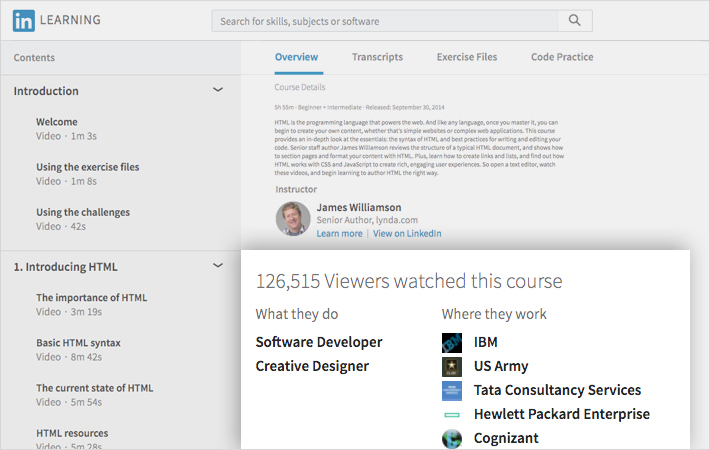 Additionally, Alex saw insights about other professionals that watched this course – how many watched the course, the most common job titles for those individuals and what companies they worked at. This helped her confirm that the course was relevant for her needs. Thankful, Alex downloaded a few of the lessons and watched them on her phone on her way home on the train that evening. But the courses aren’t solely video-based, they are interactive as well. In this specific course, there are quizzes after each chapter and a coding environment, where Alex can practice writing HTML. Alex can now rest well knowing that she has the skills needed to get her newsletter built and sent out to Acme’s customers. On her morning commute the following day, Alex logged back in to LinkedIn Learning. 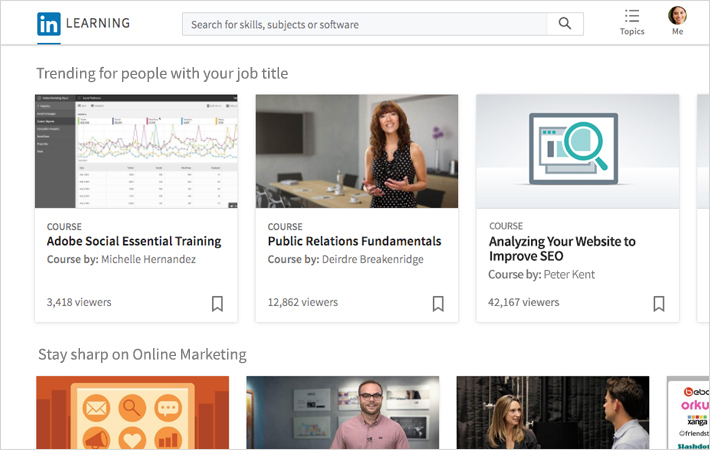 On her home page she discovered courses specifically curated for her needs, including courses related to ones she already watched, courses popular among people with her job title, courses trending at her company and even full Learning Paths where she can learn or brush up on complete skillsets. She also received a course recommendation from her organization. The L&D team at Acme had recommended a Learning Path on becoming a leader at Acme. 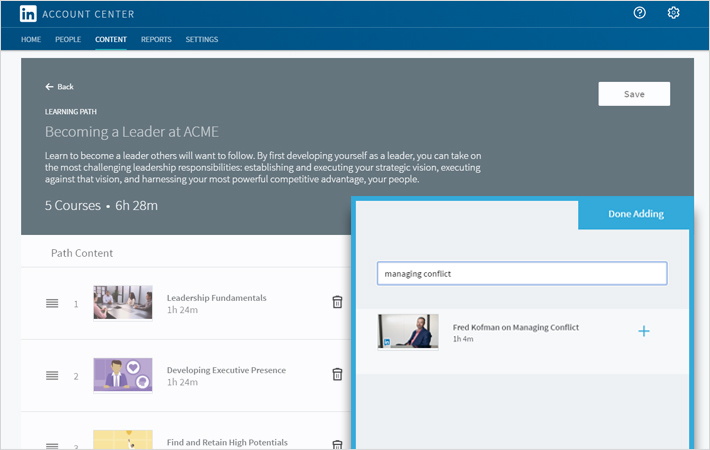 Alex recently became a manager, so she’s excited to see this Learning Path, which has a collection of courses to help her develop the skills needed to become an effective manager. So, at this point you may be asking, how exactly did Alex’s L&D team recommend that content? 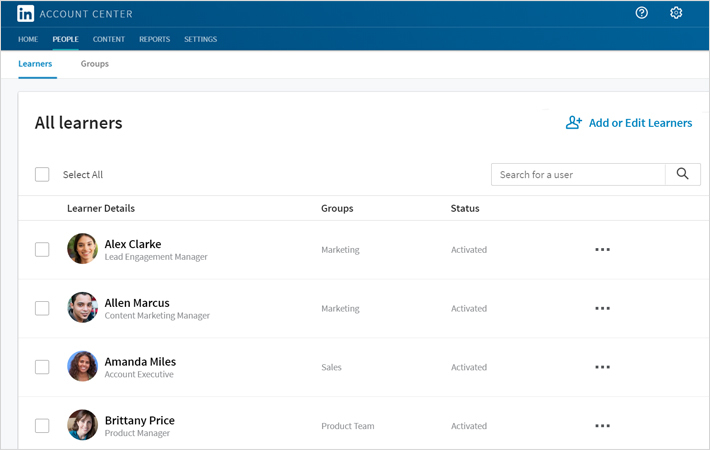 LinkedIn Learning’s enterprise product comes with a separate administrator experience for managers or learning and development professionals, who can use the platform to improve the capabilities of their team or entire organization. Emma Wilkinson is the L&D leader and LinkedIn Learning administrator at Alex’s company, Acme. 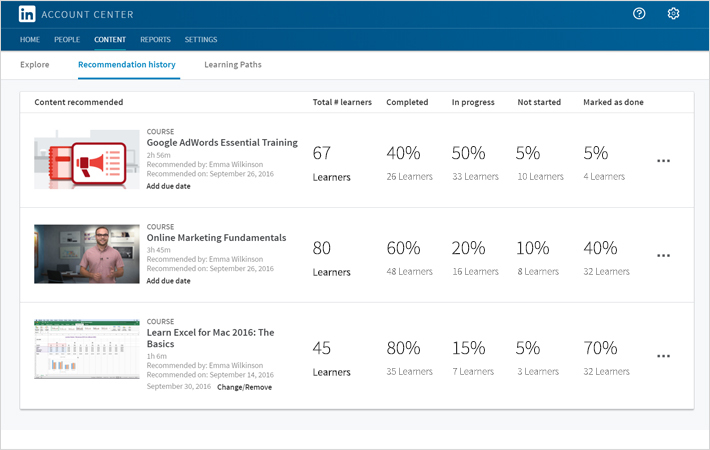 With LinkedIn Learning, Emma can easily manage learners, curate and recommend content and measure adoption and engagement with LinkedIn Learning across the organization. Acme’s marketing team recently hired two online marketers. Emma starts her day by adding these new employees to the LinkedIn Learning marketing group. She can easily add them one-by-one, in bulk using CSV upload, or by implementing single sign-on. Emma had a meeting earlier in the week with the Chief Marketing Officer at Acme. He expressed the need to engage the marketing team more frequently with learning opportunities. Emma is not a marketing expert herself, so doesn’t know the best courses to recommend. Fortunately, LinkedIn Learning can help. Emma can select from a number of job functions and immediately receive popular courses for those professionals, ensuring she recommends relevant content to engage the marketing team. And once she has recommended a course to a group of learners, Emma has clear visibility into how those learners are engaging with the course. But say Emma wants to do more than just assign a single course. Perhaps her CEO is focused on creating better people managers, and Emma wants to use LinkedIn Learning to make that happen. 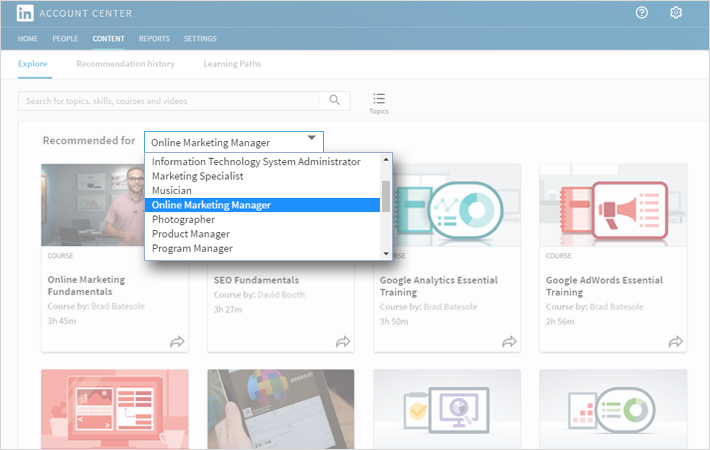 Emma can easily create a custom learning path – i.e. a collection of LinkedIn Learning courses – that she can then assign to all existing people managers. Again, she can later see which people managers have actually taken that learning path. Finally, what if Emma just wants to see how many employees are taking LinkedIn Learning courses in general? 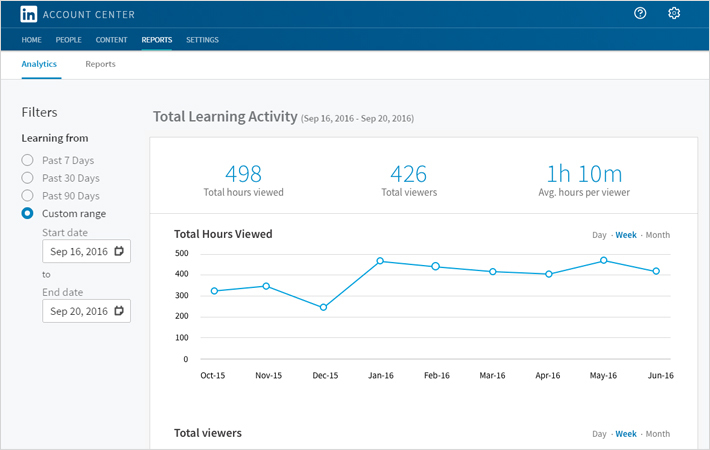 She can easily access that information in the LinkedIn Learning administrator dashboard, which shows how many learners have watched a video and how many total hours her employees have spent learning. She can also download detailed reports, which can be used to create presentations to stakeholders to demonstrate the impact that her team is having at her organization. There’s much more to LinkedIn Learning than what was just shown, but the two scenarios shed light on two common use cases. While the tool is powered by data from a network of more than 450 millions professionals and more than 9,000 expert-led courses, the platform’s goal is to be a practical, easy-to-use yet transformative solution for today’s professionals and the organizations they work for. Want to learn more? 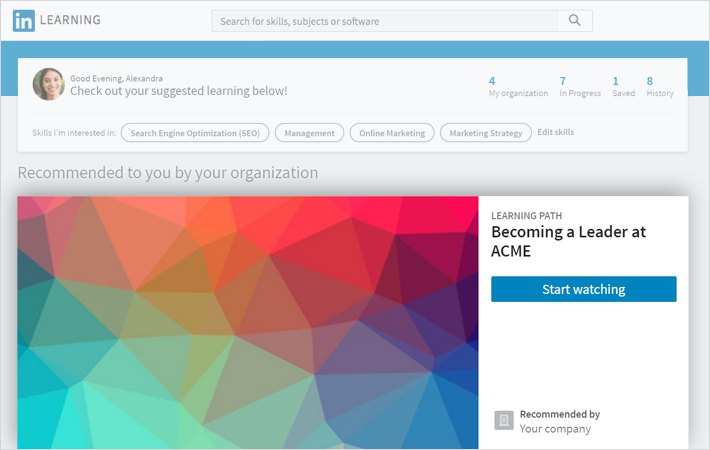 Explore how LinkedIn Learning can help your team or organization.